In this grand age of technology more and more people are choosing to machine quilt. Don't get me wrong, I have nothing against machine quilters or their work ... like anything else, if they know what they're doing they get fantastic results, and you can't argue with the speediness that they are able to get things done. Personally, I prefer hand quilting. It's all I've ever done ... I have absolutely no interest whatsoever in learning to machine quilt. I do some piecing and binding on my machine, but that's pretty much it. I don't think I can repeat that rule enough. I'm not a person who swears a whole lot, but one sure way to see the air around me turn blue is to catch me discovering a tiny straight pin hidden in the layers of some applique. Nine times out of ten it gets rammed up under my thumbnail ... this pretty much puts a halt to all quilting for a couple of days until it heals enough to hold a needle again. Trim behind applique layers. Nothing disrupts the cohesiveness of a beautifully quilted design like unevenness, but it is virtually impossible to continue with the same size stitches if the texture of the quilt changes. The thicker the piece, the bigger the stitches will be. The best way to prevent this is to remove the extra layers behind the appliqued sections. Do not layer or baste your quilt until you have spoken to your quilter. As with everything else, every quilter has a preference when it comes to this. If she doesn't have a lot of space she may want you to do it before handing it over. Depending on how she actually quilts, she may request a particular basting method. Personally, I prefer to layer and baste the quilt myself. I want to see the back of the quilt top to make sure there's nothing funky going on in there that may cause a snag in the quilting. Plus I don't use a hoop or frame, I quilt loosely in my lap, so I want it basted with bent basting pins (size 2) as shown here. I use a minimal number of pins spaced in a particular way so as to hold the quilt together without getting in my way. Many times I've received a quilt that has been thread basted or pinned with tiny safety pins ... I end up spending half a day taking it all out and re-basting myself. Ask about her preference when it comes to batting and backing. 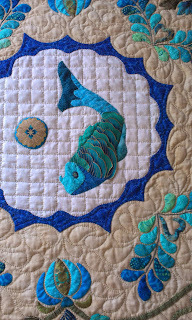 As does layered applique, the choice of batting and backing can have an effect on the quality and stitch size of hand quilting. One of the first quilts I was hired to hand quilt had flannel backing and thick cotton batting. It was a king size Double Irish Chain with velvet for the diagonal squares throughout. A beautiful quilt, no question about it, but I came to think of it as the Quilt from Hell ... it was too thick to get a very small stitch, plus it was so bloody heavy I had a hard time manipulating it as I hand quilted. Ask about thread. I generally provide the thread for my jobs unless the customer wants a particular type used. Some thread is made for hand quilting, some unsuitable for hand quilting, some are ridiculously impossible. Remember that machine thread is not the same as hand quilting thread. Metallic and rayon threads are not for hand quilting, though if your quilt is a wall-hanging and you want special fancy thread used in a few areas, it can probably be managed. I always keep a variety of thread colors on hand. I have a fair amount of white and off-white, plus solid colors and various variegated. Ask to see samples of her work ahead of time. This is particularly important if you are not already acquainted with her. I don't know any quilters, machine or hand, who would not want to show off what she has done. If she hesitates, you may want to find someone else. Settle on a price beforehand. Some quilters charge by time, others by size, but regardless she should be able to at least give you a near estimate. She may want half up front, particularly if she is providing the batting and/or backing. Remember that as with anything else communication is the key. Don't assume anything and don't hesitate to ask questions. You are spending your money on this, so you need to be sure you are getting what you want and expect. Also, your quilter needs to know what that is so she can do her job.